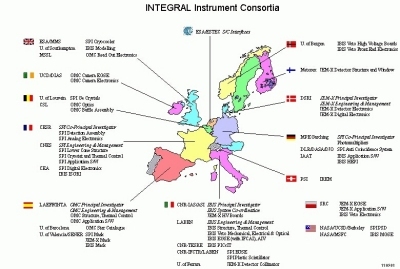 The industrial team producing the many components for the different parts of the spacecraft was made up of 26 companies located across Europe and one company in the United States. As industrial prime contractor, Alenia Spazio of Italy was responsible for the design, integration, and testing of the satellite. Three separate satellite models were constructed for the elaborate test campaigns. The structural thermal model was built for mechanical and thermal testing. With the engineering model the engineers guarantee that all electrical and software interfaces operate well. The flight model is the launched satellite.